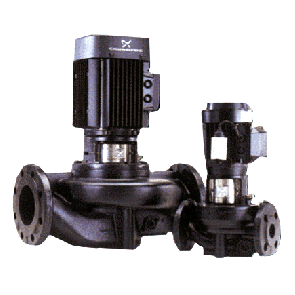 The centrifugal pump is the most commonly used type of pump in the world. Its design is ingeniously simple. A motor drives a rotating impeller, drawing the liquid into the centre of the impeller and forcing the liquid through the impeller vanes and to the outside. The centrifugal force increases the speed of the liquid which in turn increases the liquid pressure between the inlet to the pump and the outlet of the pump creating a pressurised flow of liquid. This makes a centrifugal pump well-suited to many different types of liquids including water, wastewater, sewage, petroleum, chemicals, beverages and much more. Traditionally, centrifugal pumps are used for transferring fluids with a viscosity of no more than 5500cPs. There are many types and styles of centrifugal pumps including:- Single Stage, Multistage, ISO, DIN, ANSI, Self Priming, Trash, Slurry, Split Case, Magnetic Drive, Screw, Open Impeller, Chopper, Grinder, Cantilever, Long Column, Vertical Turbine, Axial Flow, Close Coupled, Long Coupled, Submersible – to name a few! Centrifugal pumps are used extensively in many different applications including industrial manufacturing & processing, building & mechanical services, quarrying & mining, utilities, agriculture, aquaculture. Click to see our list of in-house-branded centrifugal pumps by Ultraflow.